This book is about partial evaluation, a program optimization technique also known as program specialization. It presents general principles for constructing partial evaluators for a variety of programming languages, and it gives examples of applications and numerous references to the literature. 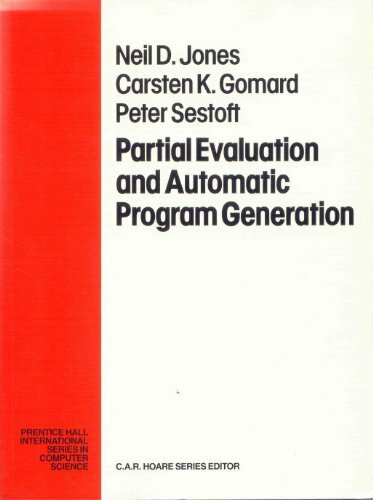 Partial evaluation works with program texts rather than mathematical functions: a partial evaluator is an algorithm which, when given a program and some of its input data, produces a so-called residual or specialized program. Running the residual program on the remaining input data will yield the same result as running the original program on all of its input data. The book teaches the reader the art of precise logical reasoning and the practical use of a proof assistant as a tool for formal proofs about computer science artefacts. All the mathematics is formalised in Isabelle and much of it is executable. These notes present principles and applications of static analysis of programs. We cover type analysis, lattice theory, control flow graphs, dataflow analysis, fixed-point algorithms, narrowing and widening, control flow analysis, pointer analysis. This website contains files on the history of computer programming language statements. The files compare programming language statements in several different languages tracing the statement from early languages to present languages.